Look at that cavalcade of crap! I swear this totally true and not at all made up story happened exactly the way I’m going to tell it. For real. With my desperate determination to whip out another landmark weekly blog post fully restored, I cranked out the following masterpiece in record time, and this time I didn’t even include a whiny little intro complaining about a random personal problem nobody would care about even if I wrote it up in my trademark hilarious fashion. So let’s begin! Bethesda Software took me for $16. Oh, I’m not saying they rooked me blind, I knew the purchase was a dirty, rotten cheat going in, and the only reason I did it was so I could later complain about it in a post just like this one. Which, since I am, I guess technically that means they didn’t cheat me, but still… If I was a civilian, I’d have been mighty peeved. I spent $16 in good American money (work with me here) on content from Bethesda’s newest brainstorm, the “Creation Club”. Shorn of all the corporate doublespeak, this is simply their latest attempt to push paid mods, opaque in-game currency, and microtransactions on the Fallout / Skyrim community, and it’s not going well. First, the selection is PALTRY. 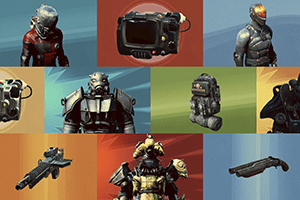 There’s a grand total of TWELVE mods for purchase in the console Fallout IV store, four of which are pathetic and unimaginative skins for the PipBoy or Powered Armor, and four more are suits of armor or weapons easily obtainable through free mods. There are two—TWO—pieces of equipment not available through free mods, only one of which is even worth considering (the Modular Military Backpack). Or, rather, it would be worth considering, if the purchase options weren’t so thoroughly borked. Setting aside the obnoxious “give us real money for non-refundable in-game currency, the more money you spend at one time, the cheaper each point is” factor, the backpack costs four dollars. Four. For a few game mechanical benefits and a kinda lame visual mod. That armor paintjob? A buck. The suit of armor recycled from an earlier Fallout game? Five bucks. Even for paid DLC, that’s a lot of expensive nothing. Let me tell you why this disappoints me, and it’s not just because EA’s “Anything to screw the customer out of a buck!” philosophy is spreading. It’s because the Creation Club is a TOTALLY WASTED OPPORTUNITY. It was announced as a chance for third party modders to work with Bethesda, to have their mods tested and certified as bug free by the makers of the game. I’ve had a rough go of mods in both Skyrim and Fallout IV, losing three or four playthroughs—about 60-70 hours of gameplay—to various bugs caused by mods. Sure, “bug free” and “Bethesda” don’t even belong in the same COUNTRY, much less the same sentence, but even “95% chance not to bork 50 hours of gameplay” would be a big step up. More, I was looking forward to, well, MODS. New NPC’s, new quests, maybe even whole new areas, ala “Far Harbor”. Modders have done this for Skyrim and Fallout IV, the chance to have it done reliably, and without voiding achievements (as mods do, but Creation Club doesn’t), was pure gold. I’d willingly pay five to ten dollars for some new adventures for Fallout IV. It will never happen. As discovered by the community just last week, the file format for the Creation Club doesn’t allow for anything even remotely that complex—in fact, the current mods (as pathetic and simplistic as they are) are pretty much the MAXIMUM complexity that can ever be offered through the CC. One suit of armor, one gun, or one limited set of furniture for your settlements—that’s it. No branching (or even lengthy) quests, no “three new guns, four tweaked guns, three new suits of armor and a new merchant NPC who offers several quests”, no fan-created counterparts to “Nuka World”. What you see is all you will ever get. All you CAN ever get. All the Creation Club currently is, is all it will ever be: a tiny collection of limited, simplistic, overpriced mods of the sort any competent modder could crank out over a weekend (even without a cranky boss threatening them with grievous bodily harm). It’s a massive disappointment and a PR disaster, and the fact Bethesda went ahead with it despite all these problems speaks poorly of its current leadership and its future as a company. Companies would do well to incorporate modders as part of their game’s creation, as Valve did with “Team Fortress 2”. In this case, though, it seems that Bethesda did so begrudgingly and unwillingly, gimping their tools from the outset. Dumb. Wait, where is the gamer idiot brigade? Its been a whole few hours and comment section is dead as can be! I love Warframe. Mostly because you don’t actually have to buy anything, but also because if you do, $4 plus some cunning gets you a slew of in-Game perks. I’d like to see more about the actual payment scheme, because the rumors are pretty grim. What I’ve heard is the modders are basically work-for-hire, get paid between a couple hundred and up to about $1000 for their mod, and have no rights to the content they create in this system. Get paid a couple hundred bucks for your mod, then watch Bethesda rake in tens of thousands of dollars minimum just because the audience is so huge in relative terms that you know there will be plenty of people buying this crap. It makes the typical tradpub contract sound like a good deal, which is hard to do. Kudos, Bethesda. Way to push the boundaries. The Fallout version of Star Citizen ship sales? Star Citizen actually got released? Who knew?